Imagine sleeping on top of tombstones each night because there is no other place to go. This is what the ITWM team experienced on Sunday, April 19th in Cebu, Philippines. They are homeless yet safe from the dangers of the street. The people are superstitious and won’t go in there to exploit these families. But there incredibly poor with no income other than what they can make and sell on the street during the day. Unfortunately some of the women sell themselves to feed their children. It is a sad reality for them with little hope of a better future. 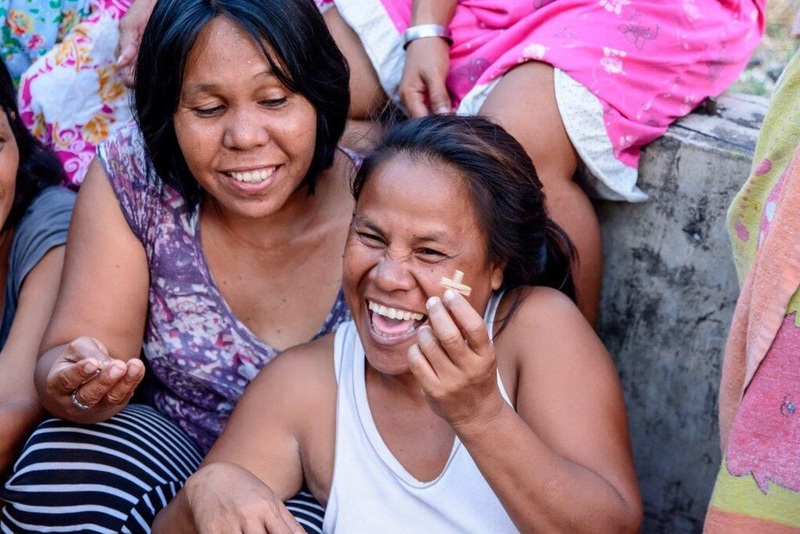 However they are finding hope in Christ as the Cebu Christian Church reaches out to them spiritually with children’s Bible Clubs and women’s Bible studies. Many have come to Christ. The church also ministers to the physical needs with food and rice for the families. We had an opportunity that day to partner with the church and bring additional help and hope. We provided a nice chicken and rice dinner for about 100 children in the Bible Club and over 50 bags of rice for the mothers. But best of all, we shared the life-changing Gospel of Jesus with them and over 30 women came to Christ. Praise the Lord! Mission accomplished! We are also making future plans to support the Cebu Church with other such outreaches as they reach their fellow countrymen for Christ! 7.8 EARTHQUAKE HITS KATHMANDU WHILE THE ITWM TEAM PREACHES IN A CHURCH! First of all, the Ignite the World Ministries Team of Mike Maksimowicz, Carl LaCasse and Jerry Heyne are all safe in Kathmandu. At about noon on Saturday, April 25th in Kathmandu, thecapital of Nepal and home to over 1 million residents, a strong earthquake hit the city and rocked the Bethlehem Kathmandu Church where we were guest preachers. The pastor had just closed the service with the benediction. The church was packed with about 200 people when the floor began to move and the building started to shake. Everyone frantically rushed through the only door of the church, screaming and yelling. The main concern was that the brick wall would not collapse on top of the people. Fortunately it didn’t and everyone was able to get out of the building safely. The pastor then called for everyone to remain calm and begin to pray. Soon a peace settled among the church members. As for our team, we then drove to the airport hoping that we could still make our flight to Pokhara where we were scheduled for an Igniter Training Conference the next day with 100 pastors and evangelists. However the airport was closed until further notice. Since the roads were in bad shape due large cracks from the earthquake, we had to stay at a hotel near the airport and wait to find out more information about further travel. On Sunday, flights were again cancelled to Pokhara and so we had no choice but to cancel the Western Nepal Outreach. However we did Skypesome encouraging words to the pastors who had alreadygathered at the church and were ready to go on with the conference without us with their own leadership team. What true Igniters! So here we are in Kathmandu, waiting until Wednesday morning where we will fly to Bhutan. In the meantime, the team will rent a taxi, assess the damages to the city, and then for the next two days reach out to the people devastated from the earthquake. We will offer consoling/healing prayer, as well as pitch in with others to provide vital relief work wherever we can. Please pray for the people of Kathmandu. *7.8 earthquake with the epicenter 50 miles away from Kathmandu, near Pokhara. *1800+ dead, nearly 5000 injured. *Thousands of people sleeping outsides due to the aftershocks. *Hospitals inundated. Medicine and supplies needed. *Many roads and buildings badly damaged. Thank you to all our supporters who are praying for this vital outreach and the safety of our team. God is doing amazing things so far in this outreach with many people in the Philippines coming to Christ, new Igniters recruited, and many poor villagers fed, clothed and physically healed. Praise the Lord! We now tackle the needs here in Kathmandu before going on to Bhutan and Calcutta, India. Carrying the Torch to the Philippines, Nepal, Bhutan and India! Well, here we go again to "ignite the world" in Asia. This will be our 11th Missionary Journey since our inception in 2009. Our first stop will be the Philippines where we will be ministering to the homeless families living in the Cebu City Cemetery. Next to the remote villagers in the mountains of Mindanao. Here we will be showing for the first time the Jesus Film in the Tagalog language. Since their is no electricity available, the entire film will be powered by solar panels. Pray that many will come to know the hope that is in Jesus. From there, off to the Himalayan Mountains of Western Nepal. Here we will be training over 100 pastors and evangelists in evangelism and missionary church planting. We will be giving out solar audio Bibles so they can bring the Gospel to remote villagers who are non-readers. Next stop to the isolated country of Bhutan. Just in the last few years, Christians were forbidden to worship. House churches were hidden and secretive. But now there is a bit more openness were believers can worship freely in their homes. This will be a scouting mission for us as we meet with Christian leaders to see how we can assist them to spread the Gospel throughout their country. Last stop is Calcutta (or Kolkata), India. Here we will present an all-day Igniter Training Conference to 60 pastors and ministry leaders who want to reach their countrymen for Christ in a greater way using some of our "evangel-tools". Please pray for us from April 17 to May 3rd. Also if you can support us bu going to our "GIVE" page on the website. I plan to blog along the way of this journey so stay tuned for some awesome and miraculous stories. Blessings! Mike Maksimowicz, Executive Director of ITWM. "I am the light of the world, whoever follows after me (Jesus) will never walk in darkness, but have the light of life" (John 8:12). This scripture is our banner and the fragrance of Christ that we take to the unreached people of Asia. Once dark places are now seeing the "light that ignites"..... Jesus Christ. The Light that brings Peace, Hope and Eternal Life. Lives and villages are now being transformed by the supernatural power of the Gospel. Today, in 15 nations/regions, over 40 leaders and 200 Igniters are carrying the torch of ITWM to bring the "Light" to their countrymen. They like us, sense the urgency of the times that we live in, and are boldly and courageously proclaiming the Good News. Check out our Testimonies here!